I remember going to SeaWorld when I was about 18 while visiting family in California after high school. The park was subpar, especially compared to the sensory-overload experience we just had at Disneyland. Now manymanymany (don't even ask me how long it's been) years later I remember two things. 1. The orca peed when he performed tricks during the whale show. 2. The flamingos were majestic, beautiful, bright gorgeous birds... until we got closer and then, oh god. Covered in bugs and stinky. So, so stinky. Never meet your heroes, kids. And stick to parks with teenagers stuck in character suits instead of animals stuck in tanks. Thankfully that was forever ago, and I can now appreciate flamingos as bright party monsters instead of stinky swamp monsters. So to the top of the cake they go! This millennial pink watercolour cake is actually baked in a 6x4 inch oval pan, creating a neat egg shape and compact size perfect for your next fête. Three layers of vegan chocolate cake are sandwiched with a smooth, silky swiss meringue buttercream. To make the whole cake vegan, I suggest a meringue frosting with aquafaba, or a vegan buttercream. Both awesome options! If you need a recipe, hit me up. *I used The Pioneer Woman's swiss meringue recipe, which I won't bother reprinting here. Please find it over on her site! Preheat oven to 375F. Prepare the 3 oval baking pans with a spritz of oil, then coat in cocoa powder (you can use the same pan with a quick wash if you don't have multiples). 2. Make 3 wells in mixture, filling the first with oil, the second with vinegar, and the third a generous splash of vanilla. 3. Pour the water over the mixture and mix thoroughly with a fork. Pour evenly into prepared cake pans and bake for roughly 20-30 minutes each. Check at the 20 minute mark for doneness, either by giving the tops a quick poke (done cakes will spring back), or a toothpick inserted in the centre (will come out clean). Allow to cool for about half an hour, then remove from the pan. Once completely cool, trim each layer into even tiers. Okay, so you have your cake and you have your icing. Super! Reserve about one 1/2 cup of the icing and set aside in a covered bowl. 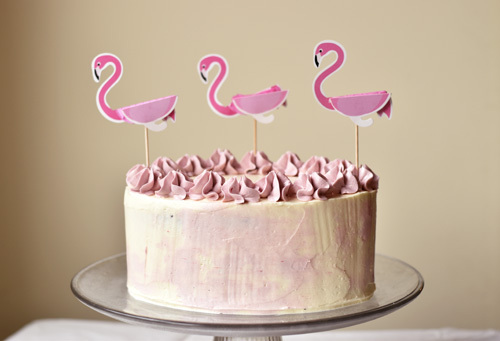 Place a dollop of icing on the centre of your cake stand. Place one layer of the cake on top and give it a soft squish to cement it into place. Smooth a layer of 1/2cm to 1 cm of icing on top of the cake, then sandwich the next layer on top. Repeat until you have three stacked tiers! Yay! Cover the whole cake in a thin layer of icing. This is your crumb coat. Either let sit in a cool spot for about half an hour to crust up a bit, or pop in the freezer for about 15 minutes. Once you've got the bad boy crumb coated it's time for the magic. Remember that icing you set aside? Grab it and pop in a drop or two of the pink food colouring. Mix until reasonably even, but remember it's not the end of the world if there are a few colour patches since we're doing a watercolour vibe here. Ice your cake again, this time with a thicker layer. Don't worry about it being messy or shaggy -- you want this! 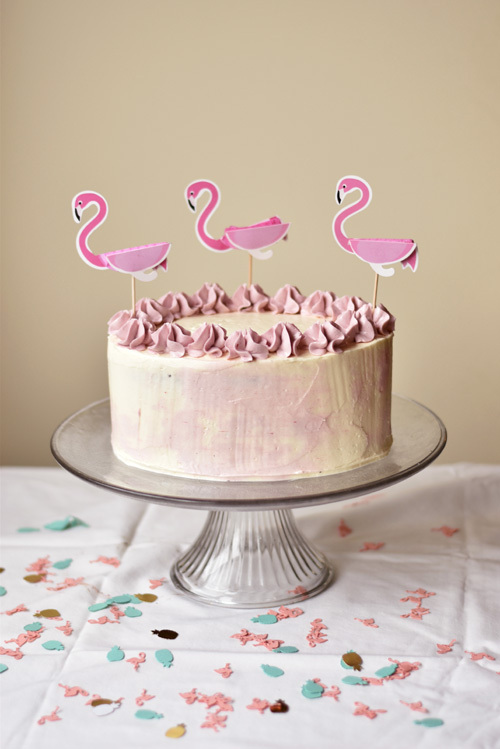 Take a few dollops of the pink icing and place them around the cake, like giant polka dots and strips. 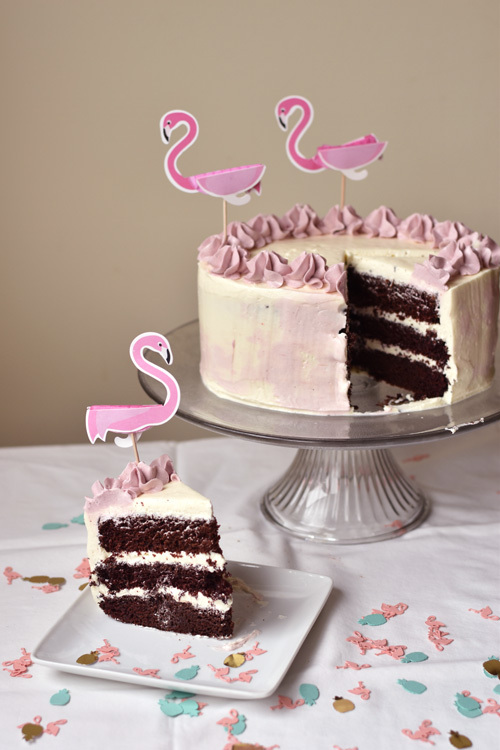 Grab a long flat spatula and drag it around the cake to create a smooth surface. This should spread the colour into the white icing for a gorgeous watercolour effect. If it's not quite up to your standards, add some more pink dots where you want more colour, and repeat! Smooth the top. Pipe the remaining pink icing around the top of the cake with a rose tip. Top with a few flamingos (which I found at Michaels but here are similar ones on Amazon) and there you have it.